Murder and mayhem in the waning years of the Roman Republic; what more could you ask for in a book? This is a tour de force of the public and private machinations of the different characters in this time period of the Roman Republic. Not only that, but the book also goes back in time to show the violence that had erupted at different times all through the Republic's life. The cast of characters is out of a Hollywood epic. Sulla, Marius, The Gracchi, Pompey, Crassus, and all of the other players are here. The book starts off with a background into the history of the Republic, specifically its political history. You will learn how the Tribunes and Consuls (among other elected officials) were supposed to, and actually did, interact in their different capacities. The author shows that violence and mob rule did not start with Tiberius Gracchus. It was simmering right below the surface of the Republic for many years. The book comes with eight pages of black and white photos of the principal players and the historic backdrops. The book ends with three appendices. The first, titled "The Butchers Bill: Murdered Roman Politicians 133-70 B.C. ", gives us a list of the men and also the reason for their murder. The second, "Who Were The Tribunes", gives the reader a list of all of the known Tribunes for the dates listed. The third appendix gives us a list of the sources used by the author in writing this book. The book also comes with four maps of the Republic in different years in which it takes place. I will admit to being extremely biased toward this time in history. I have read almost every book on the time period. I find this book to be not only an enjoyable read, but also indispensable as a handy reference of the time period that it shows. 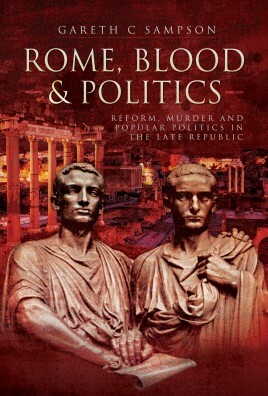 I can easily recommend Dr. Sampson's book to anyone who has an interest in not only the workings of the Roman Republic, but also the time period. I have read other books by the author, and have enjoyed them also. Now, if we can get a military biography of Pompeius Magnus from the author it would be spectacular.